Misericords hold an important place in medieval art, as they a provide tangible illustration of the many folk myths and tales in circulation at the time, as well as more Biblical images. The symbolism of the cockerel is generally associated with St Peter. I bought this in the UK, and it caught my eye for a few reasons - it's medieval (14th century), it's artistic, it's unusual, and (let's face it, the numero uno reason) it's a chicken! 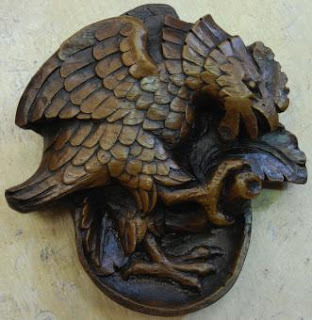 AKA 'Angry Cockerel Misericord' a 14cm x 13cm replica of a medieval carving found upon the misericords and supports within the choir stalls of Lincoln Cathedral, England. You can even buy them online here.